Having previously run a business in hairdressing and worked in the Accounts department of Newton Fallowell, Claire took over as Managing Director of the branch in 2017. 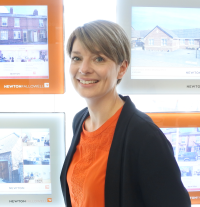 Being part of the Newton family, it is important to Claire for the team to feel like a family, which is shown in the atmosphere and working environment that the office exudes. Claire has always worked as part of a team, and therefore recognises the importance of a good working environment. Claire has ambitions to grow the business and expand the team, with another eye on opening further offices in the future. She also aspires to make both the sales and lettings processes as efficient and successful as possible, through the use of new technologies and the best possible customer service. In her spare time, Claire loves spending time with family and friends, as well as going for long countryside walks with her dogs. However, she would be willing to ditch the countryside to live in her dream location – somewhere remote and cold in Scandinavia. Claire describes herself as genuine and hard-working, which is reflected by the team, who also describe her as being very approachable and enthusiastic towards her work. ***FULL DETAILS COMING SOON*** ONE BEDROOM first floor apartment, located within close proximity to the town centre. Newton Fallowell Melton Mowbray is a Franchise owned and operated under license by SH & CS Limited trading as Newton Fallowell, Registered in England Number: OC366615 Registered Office: The Point, Granite Way, Mountsorrel, Leicestershire LE12 7TZ. SH & CS Limited is a Franchisee of Newton Fallowell Limited and not a subsidiary or sister company. VAT Registration Number: 216338617.